Some people certainly perform well under pressure. They’re the people who can wait until the last second and still crank out amazing work, to the envy of their peers. Most however, can’t bring their “A” Game under with this kind of time pressure. Procrastination results in missed deadlines, sub-par work, and plenty of mistakes. Either way, procrastination will have an effect on your health — mental and physical — and your performance. When you’re scrambling at the last minute to get something done, your level of stress increases and stress takes a very real toll on your body and brain function. Research suggests that people who are more prone to procrastination are also at-risk for serious health conditions such as cardiovascular disease and hypertension, as well as other issues such as headaches, flus and colds, and even insomnia. If you want to get ahead, get your to-do list under control, and reduce your stress levels, it’s time to stop procrastinating. However, it’s not as simple as just learning to start on projects earlier. People procrastinate for all sorts of reasons, so understanding the “why’s” behind your procrastination is crucial to understanding how you can break the habit once and for all. What Causes People to Procrastinate? Not really wanting to do something. This one is fairly simple. Sometimes we put off a task that we find very unpleasant simply because we don’t want to do it, for reasons as petty as not liking what the task entails. Sometimes we dread starting a project because of how daunting it seems. You might not know where to start, or feel like you have the requisite skills to get it done. The time commitment seems impossible to carve out. The task is too easy or too boring. Sometimes we put off starting something because it doesn’t interest us, or it seems far too simple. The assumption is that it’s not challenging and you can finish it later with ease. This might surprise some people, but being a perfectionist can also lead to procrastination. This usually stems from a desire to do something properly (perfectly) but convincing yourself that you don’t have the skills or knowledge or ability to make it that way right now. You underestimate the time it will take to complete the task. This can often tie into other reasons for procrastinating (you see it as too easy, for example), but often procrastinators put off doing something and wind up under-estimating the time required, which results in a last-minute rush to meet the deadline. Distractions, forgetting, and lack of mindfulness. Often the last-minute panic can be a result of simply forgetting that something needs to be done, and then having to scramble to take care of it. On the other hand, you might find yourself distracted by the promise of something more enjoyable or entertaining and multi-task rather than focusing on the task at hand. Mindfulness is a state in which our mind, body, and energy are operating in sync, allowing us to truly perform to the best of our abilities and talents. It is a way in which we pay attention, on purpose, in the present moment, as non-reactively, non-judgmentally, and as open-heartedly as possible (Jon Kabat-Zin). Being mindful can improve your ability to begin and complete a task. Research suggests there’s also a strong link between procrastination and self-compassion (the ability to show yourself the same kindness and empathy you extend to other people). Specifically, being able to exercise self-compassion can lower stress levels and make someone less likely to procrastinate. Work mindfully. Eliminate distractions from your environment. or a 5 minute walk around the office? These activities set you up for mindfully continuing your task. Avoid checking email, Facebook or other time-devouring activities that pull you away from your project. There are a lot of tools that can help you set the stage for a distraction free work space, including apps that can block out distracting websites (such as social media or email). You can minimize other distractions that encourage inefficient multi-tasking. Turn off the TV, for starters. Listen to instrumental music instead of music with lyrics. Reserve your most alert, productive times of the day for the most involved projects. Reduce the clutter in your workspace. Only answer emails during designated times. Work on reducing one distraction at a time, starting with the biggest ones. Give your full attention to your task and you will produce your best work. Learn a new skill, or ask for help. Don’t think you can handle a task? Not sure you can execute it as well as you imagine the final product should be? This is a great opportunity to acquire a new skill. Allow yourself some extra time for the learning curve. Likewise, if you’re unfamiliar with a task, ask someone who is familiar with it to give you some advice or even a demonstration. Ask for help or delegate things that don’t require your expertise. Don’t just make any old to-do list though. Leave off your daily tasks, the things you would do anyway. Instead, fill the list with everything you have been putting off, and only the tasks you have been putting off. Prioritize the tasks. Eliminate tasks or delegate tasks that have been the toughest in the past. Break your Project into do-able pieces. Whether you’re not sure where to begin a project or you constantly underestimate the time a task will take, you can probably benefit from creating a set schedule that will outline when you work on particular projects. Identify the first thing you can do to overcome your inertia and get started. This should be something easy and something you enjoy. Then break the project into manageable bits. Second, schedule the bits into your calendar: how much time can you realistically spend each day on the project? Allow yourself more time than you think you need, stick to it and you’re much more likely to finish a project or task on time. You may even finish early. Part of the reason we procrastinate is that we crave immediate satisfaction. If we simply don’t want to work on something, it’s a lot harder to appreciate how good we’ll feel once it’s done. Instead, we focus on how good it feels to not be working on it right now. However, there’s something to be said for finishing a task on time and not having to scramble at the last minute. Your stress levels will certainly be much lower. So remind yourself how relieved you’ll feel — visualize the happiness you’ll feel when it’s done. Yes, it’s absolutely OK to reward yourself as you break free from the habit of procrastination. Make a list of rewards for hitting milestones and completing your project. These don’t have to be expensive –maybe it’s a hike, a new book, a dinner out-whatever gives you pleasure! Being able to show yourself compassion is crucial to breaking the cycle of procrastination. Don’t beat yourself up, use your past mistakes as learning tools to improve your future. We’ve written about mindful self-compassion before, and how to start practicing it. Self-compassion is one of the keys to breaking the cycle of procrastination, and you’ll also start to see benefits in other aspects of your life as well. Procrastination has a cost, even if you’re willing to pay for it and able to perform under the stress of last-minute deadlines. But you can learn to break the cycle! 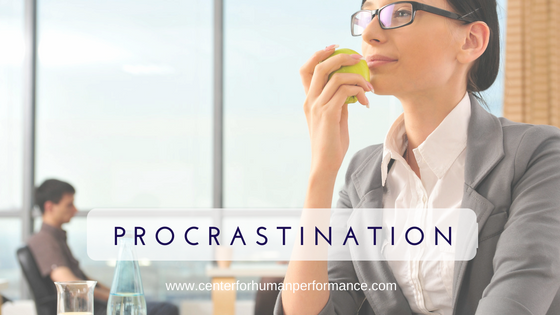 Spend some time analyzing what factors lead to your procrastination and tailor the best ways to put an end to this habit. Once you break free, you’ll start to find more time in your schedule, more balance in your life and better results in your work! Join our email Newsletter list to stay informed and receive our weekly newsletters and as our gift we will email you a free visualization/confidence audio.